The sojourners who travel the length and breadth of the Province of Bukidnon at the very heart of Mindanao – the country’s resource-rich island mythically referred to at one time as Land of Promise – cannot help but be in awe at the great beauty of its landscape. On a clear bright morning as they watch its range of mountains, undulating hills and fertile plains as far as the eye can see from a bus window, the sights can take their breaths away! The month of March seems to be the best time to fully enjoy what Bukidnon can offer the traveler in search of an “exotic” experience when there are sights and sounds that the average tourist craves. Summer would have taken over the months of rain that can cause floods and landslides. And in some of the locations, like Malaybalay City and especially the uplands, the cool wind that blows can still buffer the sun’s heat. This is the month, when the “golden showers” (those tall trees that lose their leaves as a million bright yellow flowers burst out in great abundance) have now given this location its distinct beauty, as nowhere else in Mindanao can one find such trees. And of course there is the KAAMULAN, which The Philippine Star on its front page of the 26 March 2017 issue called as “the only remaining authentic ethnic festival in the country. ” This festival celebrates the cultural legacies of the province’s seven ethnolinguistic tribes, who constituted this province’s aboriginal communities, namely, the Bukidnon, Higaonon, Talaandig, Manobo, Matigsalug, Tigwahanon and Umayamnon. They are the indigenous peoples living here since time immemorial who are spread across its municipalities/cities including Malaybalay, Valencia, Lantapan, Talakag, Kadingilan, Malitbog, Kibawe, Kitaotao, Pangantucan, Manolo Fortich, San Fernando, Quezon and Cabanglasan. Named after the Binukid word – amul (to gather) – the Lumads in some parts of Bukidnon celebrate a kaamulan, that is, to gather together for various rituals: a wedding, thanksgiving for a good harvest and to forge a peace pact. Note, there is no kaamulan if the center event is not a ritual, a sacred moment for the people to commune with the Deity they believe in. When a decision had to be made to name this cultural festival in Bukidnon (that is: to showcase Lumad cultures), it got labeled as KAAMULAN. To give it some political significance, it has been traditionally held just after the anniversary date of the province’s foundation on 10 March 1917. Its birth as a festival goes back to 15 May 1974, when Mr. Edilberto Manawag, then the Vice Mayor of Malaybalay, took the initiative of inviting a few of the Lumads to the town’s fiesta (in honor of the farmer, San Isidro Labrador, the town parish’s patron saint). His motive was quite simple: invite them to stage a few dances at the Plaza Rizal (fronting the parish church) to “enliven the fiesta goers” who, of course, were mainly descendants of migrant-settlers (speaking the dominant Cebuano-Bisaya language). It proved quite popular and became a yearly event drawing more people each year. It attracted not only the attention of the “mga taga-Bukidnon,” but the whole region. Thus, on 16 September 1977, the Regional Development Council of Region 10 declared it “the regional festival of Northern Mindanao.” And eventually, it was no longer just the local government of Malaybalay who got into the act; this became organized under the auspices of the Province – with the Department of Tourism taking a central role – with all the municipalities participating in the yearly spectacle. Indeed, when it unfolded on Saturday, 25 March 2017, the tourists who arrived here for the first time could be so easily swayed into thinking that Kaamulan is a small-scale Carnival of Rio, or its counterpart in Venice and New Orleans (all taking place just before the liturgical season of Lent begins) but with its own charming specificities. 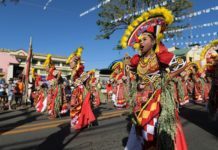 And if the tourists have gone through the circle of festivals in this Land “which is more fun” that “wears a smile all year round”, from Sinulog to Kadawayan, from Panegbenga to Dinagyang, they might be amazed at what seems to be truly the only ethnic festival in the country. That is, if the tourists are the ones Wanda Corazon Teo wants to attract so her Department can claim to reach their target numbers to please her boss. Tourists who have the money and time to satisfy their need for leisure, to live a lifestyle in search of “the exotic and magical” hopping from one grand hotel to another, tasting the local’s cuisine and taking selfies in front of the natives who look like natives in their full, colorful regalia. Tourists who only care for their short-term enjoyment, who hardly show any interest to know the true history of the place they are visiting and the struggles of those dancing in the streets for the audience’s delectation, and are shielded by the local organizers from straying into territories that could so shock them by the level of violence that they would pack up their bags and not return. For herein lies the tragedy behind the “spectacle” which is the Kaamulan. Behind the merrymaking and dancing in the streets, there are sad stories of the continuing dislocation of the Lumads from their ancestral territories as mining explorations and agri-business plantations expand. Even as gigantic floats and thousands of colorful banners sway in the wind during the parade, thousands of Lumad children are malnourished and have no decent schools where they can learn the rudiments of literacy. As a contest to showcase the Lumad’s rich cultural heritage unfolds (including romanticized pangayaw scenes where dancers show their prowess as baganis or warriors) entertaining a million people, out in the boondocks tribal leaders are being hunted and gunned down by military and paramilitary armed men if they show any resistance to their continuing disenfranchisement. The rare tourists who come to watch Kaamulan with a post-structuralist perspective could not help but deconstruct the scenes unfolding before their eyes, as they stand at the corner of Fortich and Rizal streets (fronting the cathedral of Malaybalay City) where the parade takes a turn towards the Provincial Capitol site. This deepens as they watch the showcases of the municipal contingents from the fringes of the Capitol grounds as they compete to win the sizable cash prize. They are the ones who can immediately see the ironies embedded in this cultural event as they ask these rather pointed questions to themselves. Kaamulan is at its very heart a sacred moment in the lives of the Lumads, as they commune with the spirits of their Deity and ancestors. Apart from “staging artificial ritual scenes,” does the realm of the Lumads’ indigenous belief system even provided a space in this event? If there is a feeble attempt, how so? Are there truly very distinct ethno-linguistic elements justifying the categorization of the seven tribes in Bukidnon? Who determined such a categorization? In this day and age when there are regular contacts between and among ethnolinguistic groups (including the migrant-settlers) as well as inter-marriages that have been taking place for more than a century, can there still be such sharp distinctions between these seven tribes? Who in fact actively participates in in the decision-making processes every time Kaamulan is being planned, year after year? How much is the presence of the Lumad themselves in such decision-making processes? In the actual event, what percentage of the participants in both the parade and the showcases are Lumad? As the contingents are organized along municipal lines and the easiest to recruit as dancers, musicians and props-men are those from public schools (which are mainly in big barangays and towns populated by migrant-settlers), is it safe to assume that most of the participants are really not Lumad? Certainly at the head of the 11 contingents are the municipalities’ big shots (LGU officials), followed by a sprinkling of tribal datus and their companions. One can just tell by the way they look and move. As for the young people who are the backbone of this festival in terms of person-power, one can tell there are a lot more who are children of migrant-settlers than Lumad. (If someone can do a good statistical survey, these questions can be answered fully). And the choreographers? Could it be surmised that they are “nagpaka-Lumad ra”, hired for the purpose of staging the spectacular cultural productions that highlight more its “showmanship” (to please the audience?) rather than “authenticity”? How much is the budget allocated for this spectacle? Who foots the bill which must be quite sizeable, considering the logistical demands of such an event? Will there be an accounting of such funds and reported to the people of Bukidnon? If the Department of Tourism considers this kind of festival as beefing up local economies (with the assumption that tourists, especially foreigners, bring in the moolah), are the incomes brought about by the festival more than enough to offset the heavy costs? (But I only saw one Caucasian foreigner in the midst of a million people, so is Wanda Teo correct that possibly they don’t come because of the country’s bad publicity?). If there is a sizable income deriving from this festival, where do the funds go? Are there at least some provisions that part of the income might go to build schools and health centers to benefit the Lumads? More improvement in the infrastructure? More possibilities of assisting them title their ancestral domain? So in the end, who really benefits from this festival? The Lumad peoples of Bukidnon or the political leaders, the government officials, the businessmen and their hanger-ons? So who is using who? If, indeed, the Lumads who participate are “not coerced to join” but do so willingly, what could be their motivations for participating? Certainly, we human beings need moments of joyful celebrations, as life can be so tedious, burdensome and stressful. But should we also close our eyes to the tragedies that are unfolding in our midst especially if these sustain the “historical injustices” against the very people who were in this location first, long before descendants of migrant-settlers became and continue to be the main beneficiaries of its enormous wealth? Consider how violent this local history has been through the colonial and post-colonial eras unfavorably impacting on the lives of its original inhabitants who had lived unmolested by outsiders for a very long time until the Spanish Empire’s claws attempted to colonize this area. In what is an attempt to “celebrate” the coming of the Spaniards to Bukidnon, a monument was erected in Plaza Rizal at the very center of Malaybalay. The monument is a tableau involving nine characters (five Spaniards and two Lumad with two of them holding a bangkaw) which is labeled “Errecion de Pueblo,” which recalls 15 June 1877 negotiations “when Senor Colonel of the Cavalry, five governors of the 2nd District of the military government in Mindanao, Don Jose Gallego Perez, the parish priest of the said village, Fr. Mateo Bernad de San Miguel of the Augustinian Discalced Order; 1st Lt. Don Felipe Martinez, exercising the function of Gobernadorcillo suspended the rules of their authority; aided by the Governor’s Secretary, the undersigned, Don Abelardo Cardenal Cuesta; in which appeared the magnates of the said village Datto Manpalon (Datu Mampaalong), Sugola, Min legao, Apang and Bansag. The intent of the meeting which was achieved on that same event was for the Spaniards to secure an agreement to protect the peace and harmony of the village which is under the rule of the Second District of the Military Government and to pledge to the tribal leaders and their constituents of 457 souls, their neighbors and descendants the support and recognition by the King of Spain as represented by those present.” (See the document with this inscription embedded in a plaque placed at the back of the monument). Well, the sub-text of this monument is that the people of Malaybalay/Bukidnon should take pride that this historical moment took place, and henceforth, they should be grateful to their colonizers, including the King of Spain. One could write an entire essay, unmasking the real intent of the colonizers. In fact the 457 souls then needed to be protected from the colonizers and not from the “phantom enemies” constructed in the colonizers’ minds for this singular event that opened up Bukidnon to more colonizers after the collapse of the Spanish empire, including the new American masters who dreamt of setting up vast agricultural plantations and who later brought in migrants to work the fields as they could not coerce the Lumads to work for them. This process of opening up Bukidnon had not stopped with the country becoming independent. Eventually a smart, elite political family coming from Negros would find themselves following the path of the colonizers and in the process introducing another cash crop while amassing vast hectares of prime fertile land, mostly contested by both Lumad and migrant peasant households. Land – certainly the most obvious wealth of this part of Mindanao – is at the heart of the violence that has continued to erupt in Bukidnon through the past decades. True, there had always been pangayaws taking place owing to inter-clan and inter-tribal conflicts. But these had not been so widespread, as the Lumads themselves – through their indigenous processes of conflict resolution – forge ways and means to maintain harmony among themselves. When the late dictator Marcos declared martial law, the wars became uglier and more rampant through the 16-year martial rule and have continued to persist until today. One major reason is, of course, how both the Lumads and the settlers, are confronted with land conflicts. 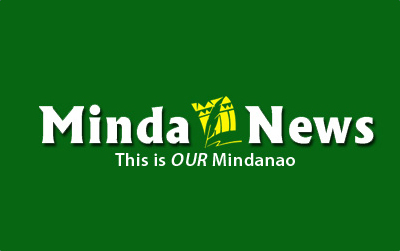 24 March 2015: A lumad leader (Manobo-Pulangihon) was killed and two others wounded when private security guards of a disputed ranch in Butong, Quezon, Bukidnon shot them. Tata Baito, a member of the Tribal Indigenous Oppressed Group Association (Tindoga), was shot dead reportedly by the private guards of Pablo Lorenzo at 9 a.m., while they were on their way to cultivate plots. Jomorito Goaynon, chair of Kalumbay in Northern Mindanao Region, said in a statement: “As the Lumads were on their way to the site, an estimated 20 to 30 armed men and security guards of Pablo Lorenzo open fired at them. Meanwhile, Baito, together with Bagna and Tumbaga, were on their way to the bungkalan when they were “ambushed.” (Dee Ayroso: “Lumad shot dead in Bukidnon ‘bungkalan’. March 24, 2015. http://bulatlat.com/main/2015/03/24/lumad- shot-dead- in-bukidnon-bungkalan/). 4 February 2017: Matanem Lorendo Pocuan (an Umayamnon Lumad leader) and another Lumad leader were shot dead in Tapyanon, Mangaod village, Cabanglasan, Bukidnon, on suspicion that they were supporters of the NPA. (Pamela Jay F. Orias, “2 lumad leaders killed in Bukidnon,” Thursday, February 09, 2017. http://www.sunstar.com.ph/cagayan-de-oro/local-news/ 2017/02/09/2-lumad-leaders-killed-bukidnon-524797. Up to the first quarter of 2017, the tensions in the upland areas that led to violence have not ceased. Recently there was a report of a killing of a relative of a top government official by the NPAs suspected of abusing the Lumad communities as well as engaging in corrupt deals. These abuses were then contained in a report and submitted to the NCIP office. But nothing was done to deal with this report. With the recent report that both the State and the CPP/NPAs have agreed to enter into a ceasefire agreement and that peace talks will soon resume, is there hope that violence will at least temporarily cease? Not likely, as many critically-minded people in the locality would claim. After all, the police command of Northen Mindanao is emphatic in declaring that “the NPA has presence in Bukidnon and has consolidated its ranks while the peace talks are ongoing.” (Bobby Lagsa. “Northern Mindanao poll violence watchlist: 47 towns, 7 cities”. http://www.rappler.com/nation/politics/elections/2016/119097-northern-mindanao-election-violence-watchlist.) Thus, the 1st Special Forces Battalion, Scout Ranger Regiment, and the 403rd Infantry Brigade of the Philippine Army continue to be on a counter-insurgency thrust. The final question then to ask is this: In such a volatile political landscape that is Bukidnon, can a festival such as Kaamulan be justified, considering the expenses as well as all the questions raised above? One hopes that the political leaders and government officials in Bukidnon would even dare ask this question and find the right answers. Among those in civil society organizations – the local churches, the media and the academe – their responses to this question could provide two positions, namely: those who say that this festival should be supported and those who would rather have the resources be used for the needs of the Lumads. As for the Lumads of Bukidnon, most of them – at least those heavily influenced by the powers-that-be, may insist on regularly holding such a festival. Those taking this view are certainly those who are able to walk down the streets of Malaybalay as they take pride in their heritage. But for Lumad communities who have been conscientized and politicized – especially by the NPA rebels in the uplands – for sure they would rather scrap this festival and demand that resources be used instead to build Lumad schools, health centers, assist them to secure titles to their ancestral domain and assistance to uplift poverty. Is there a middle ground, namely, continue to hold Kaamulan but make sure, it is truly an authentic showcase of the richness and integrity of Lumad cultures and in the process tone down its commercialization and bastardization? And make sure that not all the funds will then be used mainly to be spent for the actual festival but government funds are also spent for the Lumads’ needs. And if there is income derived from the festival, that the earnings would be used for these needs. To reach this middle ground, one assumes that the local government officials, the lumad leaders and all those involved in the planning of Kaamulan would radically shift the perspective of this festival and truly make it one that “gathers” all Bukidnon citizens in a collaborative effort to emancipate the Lumad communities to build a more just, humane and compassionate local society.